Samuro is a melee assassin and I would argue, one of the most frustrating in Heroes of the Storm. I've always loved the Blademaster, but his implementation here is undoubtedly strong. Not only does he bring high amounts of damage, but his kit has flexibility and utility to not only ensure he can comfortably deal damage, but survive when a fight turns south. Whats particularly powerful about Samuro isn't just the control he has over his damage, but also that his kit suppliments it massively. Although this build guide focuses on his Mirror Images, all his talents are fairly solid and there are effectively three ways to play him well (focusing on Mirror Images, Critical Strikes or Wind Walk). While there's no suggestion this guide is the perfect way to build him, I've had a great deal of success with pursuing a majority of the Mirror Image talents after his rework. It makes for a high burst, annoying Hero to fight against. One thing to always remember with Samuro is the fact that he's a challenging Hero to master. His combination of stealth (Wind Walk) and double trouble from Mirror Images can often feel a lot to handle. With practice however, you'll quickly grasp when it's best to use his abilities and how to engage in combat. Mirror Image (Q) - Mirror Images has two primary uses. The first is to gain additional damage from your two Images and while it's only a fraction of your own, they're capable of also dealing critical strikes and act, in many ways, like a DOT by bolstering your own output. Their second use is to body block for Samuro and to confuse the enemy. Although the Images appear gold to you, they actually look identicle to Samuro. This makes things particularly confusing during a team fight, and while their pathing is rudimentary, it's often enough to disorientate an opponent for a split second or two. It should be said that by default, Mirror Images of Samuro die incredibly quickly to AOE and as they only have 50% of your current health, if you're low health when you use them they'll die near instantly. If you can, try to not only use them at full health (or high health) but also at moments when your Wind Walk is available so you can really confuse the enemy. 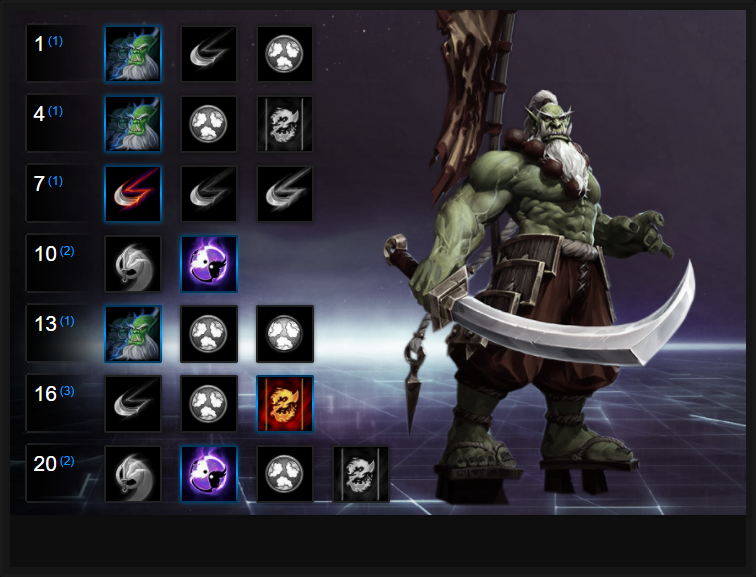 Finally, Mirror Images allows Samuro to decide where he appears upon their activation based on where your cursor is. Want to spawn at the back? Point there. Want to spawn at the front? Point there. Critical Strike (W) - This ability has two components. The first causes Samuro to deal 50% increased damage when activated, and it lasts for 8 seconds (or until you strike an opponent). The critical strike being active is indicated on the HUD (to the lower left) and your sword will also burn with fire. Considering your Critical Strike deals extra damage, it's a high amount of burst potential. Not only this, but Critical Strike also allows you to deal a free Critical Strike every 4th basic attack - again this is highlighted on your HUD. If you can, you want to be timing your Critical Strike (active) with your Critical Strike (passive) so you get two back to back. Wind Walk (E) - An incredibly strong ability that once again has two uses. Wind Walk is incredible for escaping as it allows you to not only stealth but gain increased movement speed of 25%. During Wind Walk you're also able to pass through enemies and avoid damage for 1 second when it's first cast. Its duration is lengthy (10 seconds) and the cooldown on Wind Walk actually begins when you use the ability. This is particularly powerful for Samuro as if you time it right, you can effectively use it twice in combat, to open - disengage - before re-engaging. What I will stress is that you need to be sure you won't be caught in AOE attacks after its use, such as a DOT from Kael'thas, as it will quickly pop you out of Stealth once it detonates. Finally, if you remain stationary while using Wind Walk you will turn completely invisible. Bladestorm (R) - The easiest of two Heroic abilities to use, Bladestorm offers high amounts of damage surrounding Samuro. The radius is fairly large and you can move while attacking. The fact you're also Unstoppable for 4 seconds can pretty much ensure that if you use it in a team fight, you're gaurenteed to reach your enemy even if you don't survive long enough for maximum use. Unsurprisingly and due to the strength of Bladestorm, it has a very long cooldown and you're incredibly vulnerable during its use. Samuro isn't the hardiest of Heroes and this Heroic effectively places a huge red flag on him, to burst him down. Illusion Master (R) - A complex and deep Heoric that allows Samuro to independently control each Illusion he has active. Not only that, but he can move each by itself. It's similar to controlling The Lost Vikings and unless your mind can manage micro-management in this fashion, it can become fairly complicated. On maps such as Cursed Hollow or Dragon Shire it can be particularly strong, especially if you use your Images to distract before quickly switching places. I will stress that this Heroic has a high skill ceiling and even now, after playing Samuro for some time, I'm still learning. I'll also add that the Passive of Illusion Master allows Samuro's Mirror Images to deal more damage, while his own is also increase by 10%. Better still, he can use Image Transmission more often. Way of Illusion allows Samuro to improve his own damage, through Mirror Images. Every time a Mirror Image critically hits, he gains 0.5 attack damage, up to 20. After hitting 40 Heroes, he gains an additional 20 damage. It's not enormous, but it helps his attack damage. Mirage is particularly effective as a variable against ability heavy teams. It grants two stacks of Spell Block when you case Mirror Images, reducing incoming ability damage by 40%. As a front-line fighter, Samuro needs this mitigate once he's in the thick of things. What's particularly good about Mirage is the fact you can almost always go into battle with two stacks, before using Mirror Images, to gain to more. As long as you've used Mirror Images before a fight, it's a high amount of easily obtained mitigation. Burning Blade allows Samuro to deal some AOE damage when he critically hits. The damage bonus (50% additional damage to those around Samuro) is significant, and allows him to clear waves quicker, and pressure a close-knit group of players. Illusion Master is a fantastic Heroic but it requires a great deal of time and practice to perfect. It's the bedrock of most Mirror Images talents and is a must if you're pursuing it. Simply for the fact it allows you and your Mirror Images to deal significantly more damage is the primary reason for taking it and with practice, can see you become very difficult to pin down. Mirrored Steel allows basic attacks to reduce the cooldown of Mirror Images by 1 second for each attack you land. Considering how mandatory it is for Samuros build, it's a no-brainer. Press The Attack allows Samuro to gain +10% attack speed - up to a maxium of 40% - every time he and his Mirror Images attack. Considering how rapidly you and Mirror Images can attack, Press The Attack is easily capped. The attack speed is amazing for clear merc camps, or quickly delivering attacks before leaving a fight. Three Blade Style allows Samuro's Mirror Images to gain an additional 50% of his health, while lasting 36 seconds. The additional time allows Samuro to lane better, clear easier and distract for longer. It also means he will typically have a Mirror Image available to swap to. These Hero Threat Levels (1 being lowest threat and 10 being highest threat) are to help you determine which enemy Heroes can give you a headache. For the Heroes listed here, take extra care as they're particularly dangerous for Samuro. Lunara: Her mobility, nuisance poison and vision make her a challenge for Sumaro. You'll not be able to really hit her and she can constantly poke you. Tracer: She's super fast, can Blink out of attacks and then come back for more. Thrall: His root, ranged poke and self healing are very difficult to deal with. Even with your Wind Walker, he'll mop you up quickly. The Butcher: Onslaught and Lamb to the Slaughter can destroy you near instantly. There's absolutely nothing you can do against him during that window. Illidan: Evade, self healing, mobility, damage - he's a headache you just can't get rid of and he can block most of your attacks. Valla: She has tons of basic attack damage, can stun you with her Ultimate and burst you down incredibly quickly from afar. This list of tips and tricks are just a handful of things we think will help your Samuro play. We'll continue to add to the list as required and if you have any tips you'd like to share, let us know in the comments below and we'll place them here. 1. Samuro has no poke. You rely entirely on the distraction of Mirror Images and Wind Walk to reach your targets. Be sure to have them available at every team fight. 2. Always try to time Critical Strikes so you gain its benefit after or before a passive bonus. 3. Your Mirror Images die incredibly quickly by default. Use them to block spells or to distact while you Wind Walk away. 4. When you trigger Mirror Images can choose where to appear based on your cursor. Try to act like an AI enemy so your opponent doesn't guess which is which. 5. I've found that when you trigger Mirror Images, you'll typically want to place yourself at the back when retreating, or top (front) when attacking. Even so, try not to be predictable and use your Trait to swap places if needed. 6. Mirror Images is as much about damage as it is distraction. 1 on 1 they offer a considerable increase to your damage and benefit from all your Critical Strike talents. 7. Try to maintain your movement speed buff (Trait) as much as possible. The movement speed increase is significant, but brief. 8. If you can, always try to engage having used Wind Walk. You'll trigger the bonus damage and then be able to use again not long after. 9. By default your Mirror Images will randomly attack targets, if there are multiple. 1 on 1 however, they'll focus their attention. 10. If you want physical control over your Mirror Images, you have to take Illusion Master. It's the only way to ensure during a team fight your Images concentrate their attacks. 11. If you can, a good method of attack is to open with Wind Walker to trigger your damage bonus and immediately use Bladestorm. You'll then have Wind Walker available again to teleport to them (if they're trying to run) before using Critical Strikes twice. 12. The emphasis on this build is utilising your Mirror Images to burst opponents quickly. Always have Mirror Images ready for when attacking. 13. Wind Walker provides damage reduction and an unbreakable stealth but only for the first second. Combined with the leap thanks to the level 13 talent, you'll rarely get caught out. 16. Samuro is weakest during long fights as if his health his low, his Mirror Images will become paper thin and die incredibly easy (they only have a proportional % of his health). Thanks for reading our Samuro guide! You can now help support Ten Ton Hammer, so we can keep writing guides like this.